Product prices and availability are accurate as of 2019-04-19 13:42:55 EDT and are subject to change. Any price and availability information displayed on http://www.amazon.com/ at the time of purchase will apply to the purchase of this product. Sharp-edged T-post tops can be dangerous to your horses and livestock, causing injury to the animals and expensive veterinary bills for you. 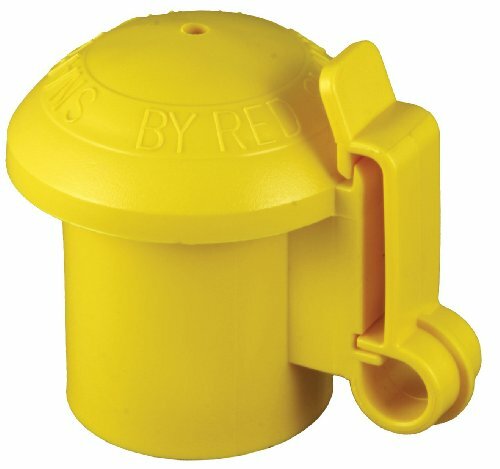 The Red Snap'r Yellow T-Post Safety Cap & Insulator protects animals from the sharp-edged T-post tops. They fit 1.25 and 1.33 T-posts and accommodate any gauge wire, too! These yellow electric fence insulators are packed 10 per bag.